Pastor David A. & Lady Jacques McNeil lead a vibrant and cutting edge church richly named Transforming Lives Community Church-TLCC in the Los Angeles area. 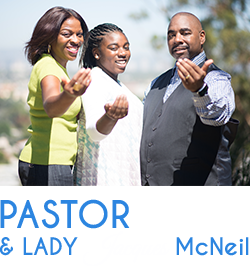 Pastor David and Lady Jacques have been married for more than 22 years. To their union they have been abundantly blessed with an anointed and energetic daughter Micaela. Transforming Lives Community Church came into existence long before the Lord spoke directly to Pastor McNeil on December 28th, 2014 during a worship service at West Angeles COGIC. After intense prayer and fasting with the Lord, confirmation from my wife as to the Pastoral Call, and support, wisdom, and counsel, from my spiritual father and Pastor Bishop Charles E. Blake…Transforming Lives Community Church began to manifest and take flight. The essence of TLCC is based on the expected Spiritual and Personal growth of each Transformed Believer, to apply the Word of God to every situation that they face with absolute faith, trust and obedience to God’s Word. Pastor David A. McNeil is a sought after preacher/public speaker and seminar presenter in both the religious and secular communities with 25 years of experience in dynamics, motivational speaking, community resource connection, evangelistic leadership and organizational development, relational behavioral training, and consulting. He is the founder of “1 Soul At A Time” Ministries and Operation Re-Launch, a ministry specializing in the empowerment of individuals and organizations, in the full realization of their designed mission for service. His ability to identify the issues of challenge for individuals and organizations; while, providing cutting edge practical solutions sets him apart. His experience and expertise can be traced to the exposure received from the deposits made by some of God’s most gifted leaders. He Credits Bishop Charles E. Blake of West Angeles Church of God in Christ (COGIC) and Presiding Bishop for the COGIC Denomination Internationally, his pastor since 1988, with the most significant contributions made in both his spiritual and personal life. Ordained in 1994, under the leadership of Bishop Charles E. Blake, God has supernaturally given him a word of transformation of hope and deliverance to a dying world. Pastor David A. McNeil also directed the Community Assistance/Emergency Services (9 yrs) for the West Angeles Community Development Corporation, a Assistance/Emergency Services Department provides various forms of social assistance to more than 10,000 individuals annually. Additionally, he also served as the director of Evangelism (17 yrs) for West Angeles COGIC a congregation of 24,000. Under his leadership, 1,200+ individuals outside of the church walls annually ministry of West Angeles Church of God in Christ. The Community gave their lives to the Lord. He also has been extraordinarily blessed to have assisted some of the most heralded and anointed leaders and ministries: altar assistance and service with the late Bishop G.E. Patterson-Bishop T. D. Jakes- Pastor Rod Parsley- Dr. Myles Monroe- R. W. Schambach- Dr. I.V. Hillard- Bishop Paul S. Morton- Dr. Creflo Dollar and others, Hurricane Katrina- directed 1,500 volunteers in a major clothing distribution sending 9 fully loaded Semi’s to affected areas while providing tech & distribution support to those areas from Los Angeles, Larry Jones and “Feed the Children”- directed major ood distribution campaigns (1,000- 3,000 families), March For Jesus 1998 (directed Evangelistic Campaign- Los Angeles), Christopher Sun Crusade- Los Angeles Coliseum-1997 (served as a regional outreach director). Included in his satchel of accomplishments are his distinctive work in facilitating and teaching the following seminars, trainings, workshops and conferences: Church Growth- “Growing and Building from the Inside Out”, Leadership Development- “The Dynamics of Change and Transition”/ “Preparing Leaders to Be Transformational Vs Transitional, Assimilation-“How to Turn a Member into A Committed Member”, Relational Development-Singles -“Understanding Me Before We” / Married-“Igniting the Fire, Unleashing the Passion”, Community Assistance –“Connecting to the Resources”; “Christian Growth – “Why Was I Created?”/ “What are my Spiritual Gifts?” and various series in Evangelism including: Evangelism 101, Cult Awareness and Apologetic training (Explaining the truths of God). Lady Jacques McNeil is an anointed Licensed Evangelist Missionary; and, profound speaker who advocates for Women in the areas of personal growth and development. She is a woman given to prayer and consecration and she is a committed intercessor. A strong gift of discernment is what enhances her ability to uncover and bring clarity to many complex situations. Lady Jacques is a leader amongst leaders and with an exceptional gift of administration. She is the founder of Women Inspired Through Networking Elements Sister to Sister (W.I.T.N.E.S.S.) Book Club, a unique Christian literary ministry (20 yrs) that reaches beyond the boundaries of an ordinary book club. In addition to reading a book-of-the-month, women from all backgrounds come together to fellowship, network and challenge each other to move higher in God. The meetings exude a warm anointed atmosphere that enables women to feel comfortable, discussing issues that have plagued them without the fear of being ridiculed or judged. There is also a deep sense of sisterhood that fosters accountability among our members. Through the ministry of W.I.T.N.E.S.S. Book Club the very heartbeat of God is unveiled. W.I.T.N.E.S.S. Book Club is much more than a book club! We reach and teach through fellowship that fosters healthy relationships by Our Literary Selections, Our Community Outreach, Our Health & Wellness Programs, Our Monthly Intercessory Prayer & Corporate Prayer, and Identification, Activation, and Cultivation of each woman’s gifts, challenging each woman to step outside of her comfort zone. W.I.T.N.E.S.S. Book Club conferences have presented some of the premiere religious speakers and authors. Some of the authors who have left life changing impressions on the audiences are: Bishop Charles E. Blake, Dr. Ronn Elmore, Elizabeth George, Dr. Wanda Davis Turner, Michelle Hoskins, Lady Kimberly Blake-Ludlow, George Thompson, Debra Pegues, Pastor Sarah Morgan, and Pastor Theresa Ordell. She accepted the call of God to educate, motivate, inspire, enhance, and encourage the lives and lifestyles of believers and non-believers. To date, her ministry has transcended beyond the Church walls. She has been afforded the rare opportunity to minister in both religious and corporate arenas, as well as governmental environments. Together, Pastor David A. & Lady Jacques McNeil have merged their anointing, expertise, skill, and, through “Transforming Lives Community Church”, to provide unheralded insight and consultation in the areas of: Leadership Development, Ministry and Business Infrastructure Development, Church Growth, Assimilation, Relational Dynamics, Pre-Marital Counseling, Marketing, Mediation, Conflict Resolution, Community Resource Connection, Customer Service & Communication Training, Diversity Training, and many other disciplines of development. Additionally, they hold certifications as Human Behavioral Consultants and Conflict Resolution, Mediation and Anger Management Specialist, which gives them an added advantage in both deciphering, and then providing solutions to challenging issues that affect interpersonal and organizational relationships.